Set on the South Side of Aylesbury, within walking distance of Aylesbury Grammar and High Schools, with Driveway Parking to the front and Spacious Living Accommodation. Having been recently carpeted the property is well presented and briefly comprises entrance porch, entrance hall, lounge/diner, kitchen, refitted downstairs shower room, three good sized bedrooms. 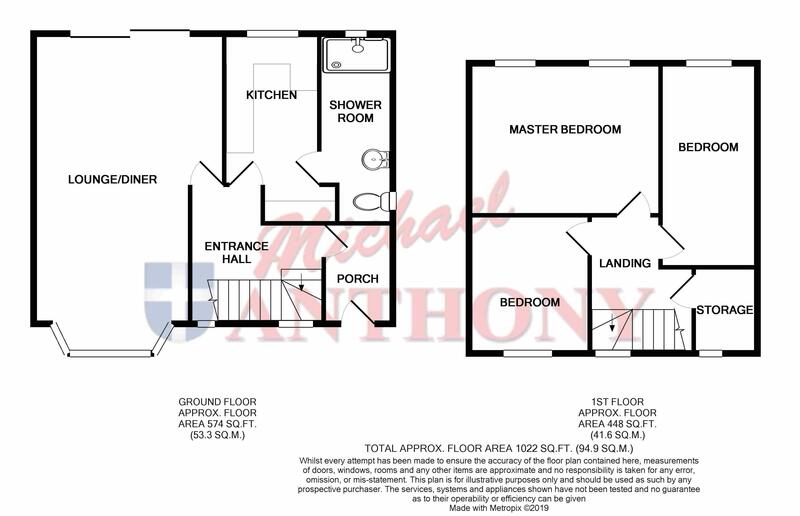 Front and Rear Gardens, Double Glazing and Gas Central Heating. Call Ben to view. Wood effect flooring, doors to lounge and kitchen, stairs rise to the first floor with storage cupboard under, frosted UPVC double glazed window to the front. Wood effect flooring, two radiators, UPVC double glazed bay window to the front aspect, UPVC double glazed sliding door to the rear garden. Tiled floor, refitted with a range of storage units at base and eye level, rolled edge work surface areas, one and a half bowl single drainer sink unit with mixer tap, space for cooker, fridge/freezer, washing machine and dishwasher, wall mounted gas boiler, tiled splash back areas, door to shower room. Refitted shower room, tiled floor, large shower cubicle, wash hand basin, low level wc, extractor, radiator, two UPVC double glazed windows to the side and rear. Doors to all rooms, UPVC double glazed window to the front, access to loft space, storage cupboard with window to the front. Recently recarpeted, radiator, dual UPVC double glazed windows to the rear. Recently recarpeted, radiator, UPVC double glazed window to the rear, large storage cupboard. Recently recarpeted, radiator, UPVC double glazed window to the front. Driveway parking to the front. Laid to lawn with hedge border. Laid to lawn, enclosed by fencing with gated side access.